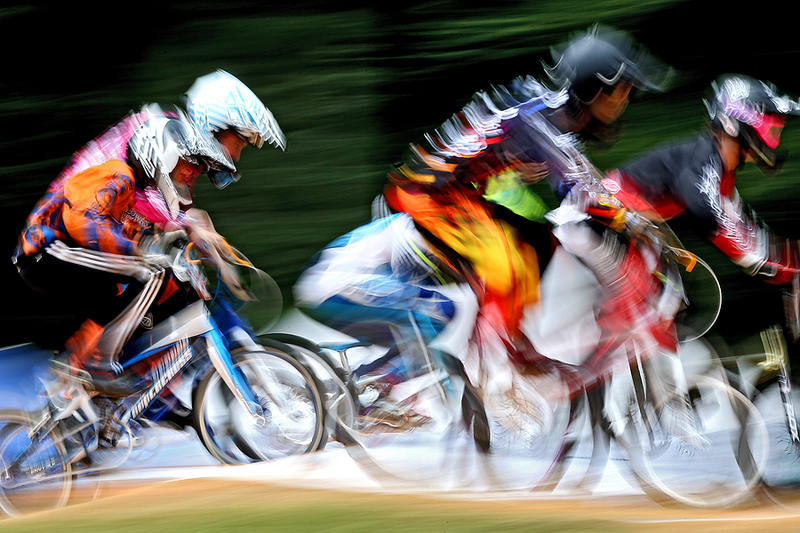 "BMX riders race during the East Coast Nationals at Chesapeake BMX on June 13, 2015 in Severn, Maryland." Each season there are major sports that need coverage - summer is to baseball as fall is to football. Changing seasons means changing sports and it's easy to feel like you're only shooting one sport, even though many are happening around you. So it's always refreshing to break away from the normal realm of sports assignments. When I saw that the East Coast Nationals BMX races were happening close to home I knew it would be a lot of fun. It's been quite some time since I documented bicycle racing in any form, too. I was hoping this would be a great feature as the Olympic near and BMX racing is now an official sport. Since a lot of the racing was of those younger than the Olympics typically allows (though some could compete in other Olympic sports), I had fun shooting a majority of the races are very slow shutter speeds to create an universal feel. This was one of my favorite pans from the many, many races.